Dwaraka is one of the four major Hindu shrines in India. 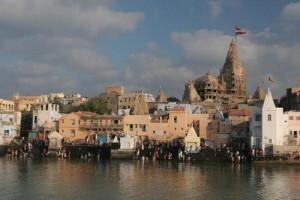 The city of Dwarka was built 2500 years ago as the capital of Lord Krishna’s Empire as per Hindu mythology. 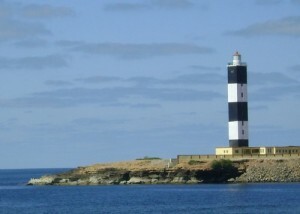 The 150 ft. high lighthouse of Dwaraka is also famous all over Asia. One of the four Shaktipiths, established by Shree Shankarcharya is based at Dwarka. About 30 kms away from Dwarka is Okha port from where one can catch a ferryboat to reach Bet-Dwaraka. Mahaprabhuo’s Bethak, Gomti Ghat, Shankh Talav and Nageshwar are important places for tourists. Air: Jamnagar airport is 148 kms away from Dwarka. Flight for Jamnagar is available from Mumbai. Rail: There are trains for Okha(Dwarka) from Mumbai and Ahmedabad. Road: Dwarka is 453 kms from Ahmedabad. Private Luxury Buses and Gujarat State Transport Service Buses are available from Ahmedabad and other cities of Gujarat. This entry was posted in Dwaraka, Gujarat and tagged Holy Place, lighthouse. Bookmark the permalink.